Thornton Wilder’s minimalist 1938 Pulitzer Prize winning play takes on new relevance in this updated interpretation. Join us in Grover’s Corners as we watch two families grow, change, and weather life’s ultimate transition together. 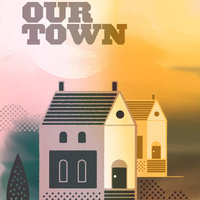 Emphasizing the ordinary magic of everyday details, the importance of belonging, and the inevitability of loss, LSU’s Our Town offers a refreshing tonic for a troubled world. This performance is supported by the Student's Performing Arts Fee.